If you live in Sydney you would understand how hot it gets in summer with temperatures averaging 30 degrees so its no surprise the beaches are always packed and the ice cream shops are always full. Unfortunately I don’t live near the beach, as much as I would love to (maybe one day!) so my favourite way to cool down is to eat haha :p Before you start thinking about how weird that is, I’m talking about ice cream! 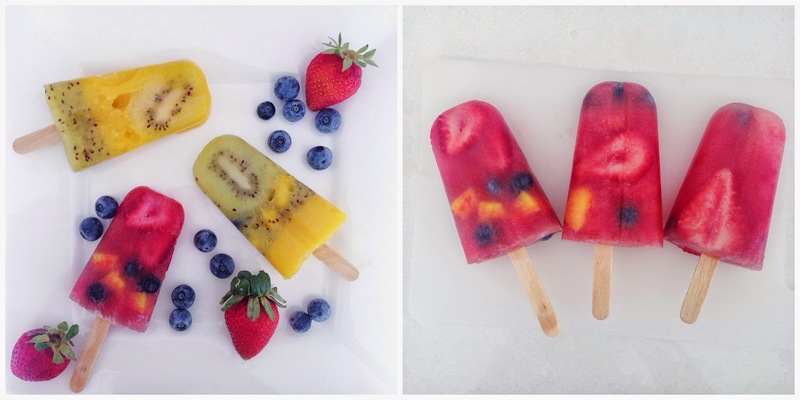 And since I’m a fruit lover (and sometimes health freak) I thought about combining these two and making fruit popsicles which I’ve always wanted to make but was too lazy to. I didn’t really follow any recipes although there are a million out there. I think you can make it according to what you like to eat or what you have at home. My first popsicle was a watermelon one because my mum made some fresh watermelon juice and I wanted to experiment and try out the popsicle moulds that I had recently bought. You can buy them from anywhere but I got mine from the dollar store for a few dollars. These popsicles are super easy to make especially coming from a lazy person like me haha. Cut the watermelon into slices and put it into the juicer until blended. Put aside. Place the fruit into the moulds as desired and pour the watermelon juice over the top. Stick a paddle pop stick in the middle or use the stick that came with the mould. Put into the freezer and refrigerate for about 4-6 hours or until frozen. Enjoy! If you find that the popsicles are hard to get out, run the mould under hot water and the popsicle should slide out more easily. Cut the kiwi fruit in half and scoop out the flesh. Do the same for the mango. If you want some chunky bits in the popsicle slice a few pieces of kiwi fruit and dice some mango and put aside. Blend the kiwi fruit and mango separately until smooth. Place the fresh fruit into the moulds as desired and half of the fruit mixture into the mould. Refrigerate until half set and pour the remaining mixture over the top. Place the stick in and put it back into the freezer. Refrigerate overnight or until set. You can add any fruits to the mixture and experiment with your own combinations! These were super yum and you can try using yogurt if you prefer a more creamier popsicle. It’s a great alternative to eating ice cream and you can feel slightly healthy while you cool off from the hot weather :) I'm definitely going to try a whole lot of different combinations this summer! Let me know what your favourite popsicle combos are. would love to try these!! look so nice!